Heat the oven to 400°F. Place the fennel, onions and garlic into a large bowl. Add the oil and toss to coat. Spoon the fennel mixture onto 2 rimmed baking sheets. Roast for 30 minutes or until the fennel mixture is lightly browned, stirring occasionally. Reduce the oven temperature to 350°F. Stir the fennel mixture, lemon zest, parsley, pine nuts and broth in a large bowl. Add the stuffing and mix lightly. 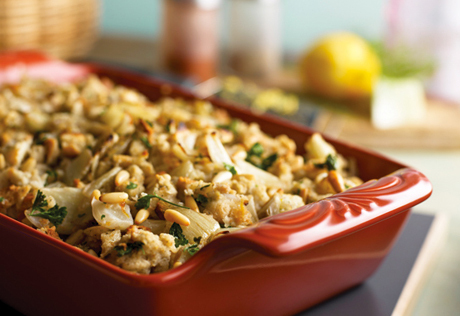 Spoon the stuffing mixture into a greased 3-quart casserole. Cover the casserole. Bake for 30 minutes or until the stuffing mixture is hot.